This article is about the road going version of Tipo 33 racing car. For the racing car, see Alfa Romeo Tipo 33. For the family car, see Alfa Romeo 33. 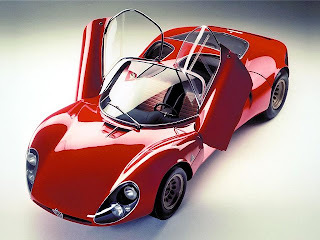 The Alfa Romeo 33 Stradale is a mid-engined sports car built by Alfa Romeo of Italy. "Stradale" (Italian for "road-going") is a term often used byItalian car manufacturers to indicate a street-legal (usually heavily modified and/or underpowered) version of a sports car. The car was introduced at the Sport Car Show at Monza, Italy in September 1967. Only 18 have been made. The prototype (chassis No. 750.33.01) was sold to private Gallery Abarth, Japan, a magnesium bodied Stradale replica (chassis No. 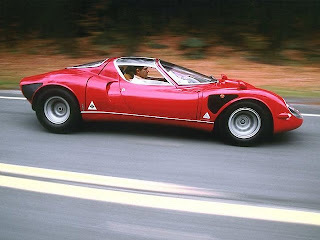 105.33.12) built in late 1970s and the five concept cars are now part of the Alfa Romeo Museum. 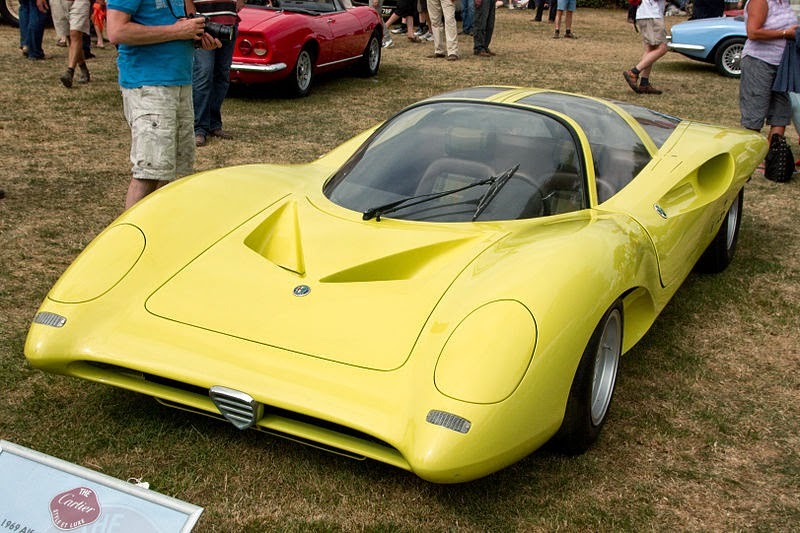 In Top Gear's 100 Sexiest Cars list, the Alfa Romeo 33 Stradale was featured as number 15. Built in an attempt by Alfa to make some of its racing technology available to the public, it was the most expensive automobile for sale to the public in 1968 at US$17,000 (when the average cost of a new car in 1968 was $2,822). In the same year, in Italy, the retail price for a 33 Stradale was 9.750.000 lire. Just to make a comparison, the Lamborghini Miura was sold for 7.700.000 lire, while the average worker's wage was about 150.000 lire. The 33 Stradale is the first production vehicle to feature dihedral doors, also known as butterfly doors. The 33 Stradale also features windows which seamlessly curve upward into the 'roof' of the vehicle. The car has aluminium body on aluminium tubular chassis. As a result of being built by hand, each model differs from the others for some details. For example, early models had twin headlights, replaced in the last ones by single lights. The position of the windscreen wiper, and even the number of them, is another thing that differentiates each example from the others. Also the late models have vents added behind both the front and rear wheels to allow hot air from the brakes to escape. The race-bred engine bore no relation to the mass-produced units in Alfa's more mainstream vehicles. Race engineer Carlo Chiti designed an oversquare (78 mm (3.1 in) bore x 52.2 mm (2.1 in) stroke) dry-sump lubricated all aluminum 1,995 cc (121.7 cu in) V8 that featured SPICA fuel injection, four ignition coils and 16 spark plugs. The engine used four chain-driven camshafts to operate the valve train and had a rev-limit of 10,000 rpm. The engine produced 230 hp (172 kW) at 8,800 rpm in road trim and 270 bhp (201 kW) in race trim. The engine valves are operated via chain-driven double-overhead cams and has a 10.5:1 compression ratio. Because every Stradale is hand built and unique the power levels can vary by car, used rpms etc., for example the first production Stradale (No. 750.33.101) has factory datasheet that claims 243 hp (181 kW) at 9,400 rpm with a "street" exhaust and 254 hp (189 kW) with open exhaust. The car takes 5.5 seconds to reach 60 mph (96.6 km/h) from a standing start and has a top speed of 260 km/h (160 mph). In 1968 it was the fastest commercially available car in the standing kilometer with time of 24.0 seconds measured by German Auto, Motor und Sport magazine. Similar performance cars on that time were all using twice the Stradale`s cylinder capacity, theLamborghini Miura, Ferrari Daytona and Maserati Ghibli. 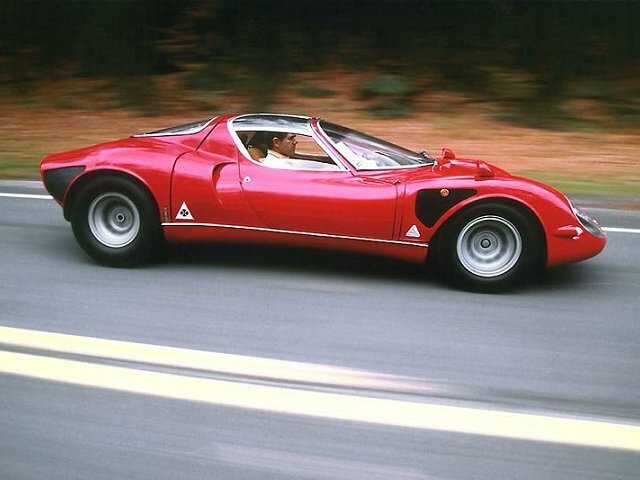 The Alfa Romeo 33 Stradale are hardly ever traded; thus their value is very hard to estimate. Marcello Gandini designed the Carabo, a wedge-shaped coupe with scissor doors, in 1968 for Bertone. The car was built on the chassis No. 750.33.109. 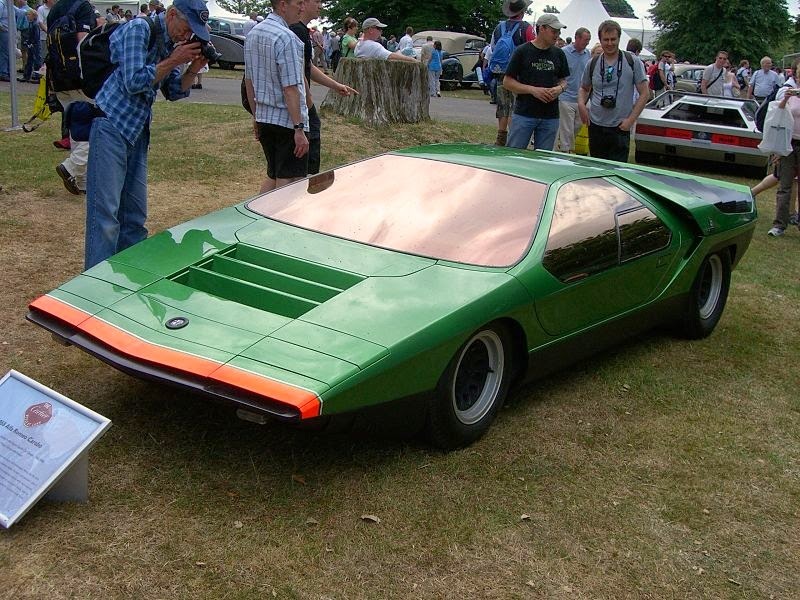 In 1976 Bertone made the Navajo No. 750.33.117, a massively-acting closed coupe with angular contours and large roll bar. The P 33 Sport Roadster of 1968 was an open vehicle with a lower windscreen and a striking, painted in dark color roll bar. The vehicle used in the chassis No. 750.33.108. It was at the Turin Motor Show, presented to the public in November 1968. Its whereabouts are unclear. Partly it is considered that the body of the P 33 was removed after the public exhibition, the chassis and two years later with the body of the Cuneo had been provided. The Prototype Pininfarina Speciale 1969 was a rotund coupe with gullwing doors, pop-up headlights and heavily glazed cockpit that some design ideas later Ferrari anticipated models. Use the vehicle chassis No. 750.33.115. It bore a striking yellow paint. The Pininfarina Cuneo was an open, wedge-designed sports car that was presented at the Brussels Motor Show in January 1971 and probably also based on the chassis No. 750.33.108. Italdesign, founded by Giorgio Giugiaro presented the Iguana at the Turin Motor Show in November 1969, it is a closed two-seater sports coupe with an unusually high hedge on the basis of the chassis No. 750.33.116. The design showed some new elements, that Giugiaro few years later introduced in production vehicle designs. 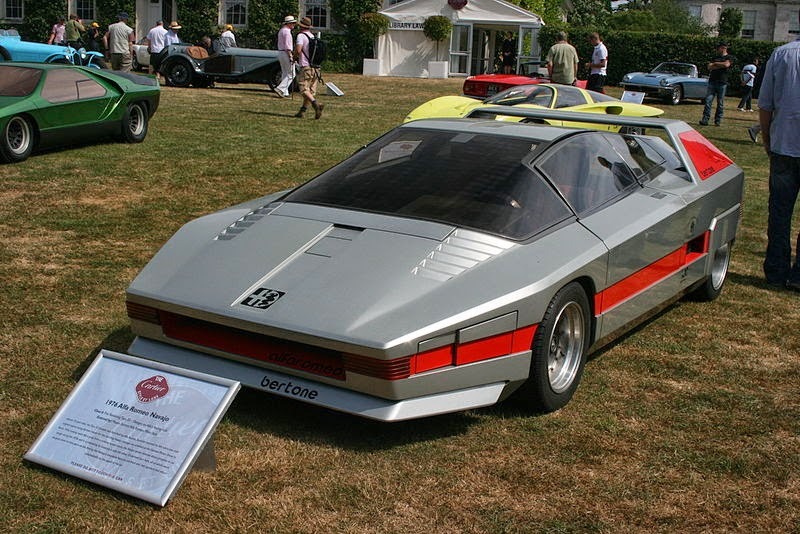 Thus, the body of the Iguana was made of brushed steel, this concept Giugiaro realized later when De Lorean DMC-12 . 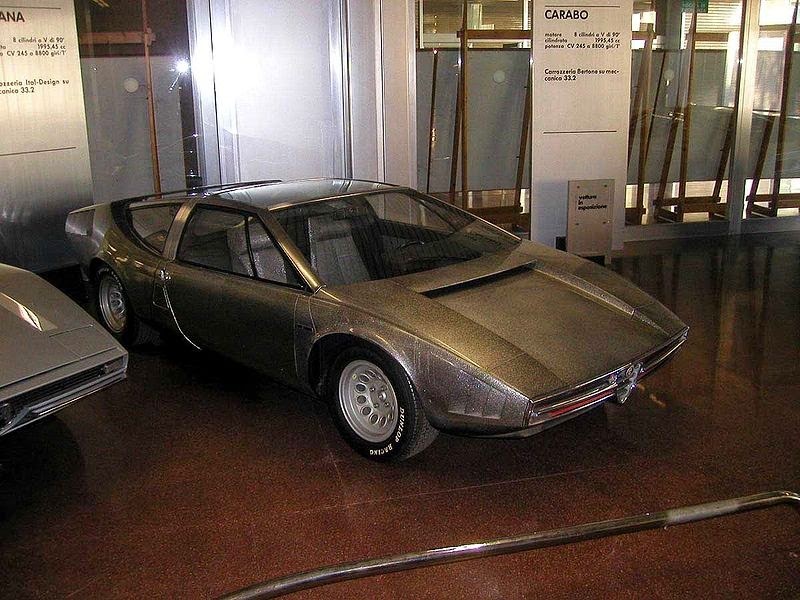 The front end of the Iguana Giugiaro quoted in his designs for Maserati models Bora and Merak, and the rear end with the high-mounted tail lights were put into production in the Alfa Romeo Alfasud Sprint. Allegedly, a serial production of the Iguana was planned, the intention never realized, however. Last updated on 3 April 2014 at 22:26.